Those keyless ignitions found in many newer cars certainly are handy, and not just for car owners. They're a real time-saver for car thieves as well, according to the National Insurance Crime Bureau (NICB). The insurance industry group says the number of “freebie” vehicle thefts in the U.S. climbed 22 percent in 2015 to 57,096. It notes that the actual number is probably quite a bit higher since many consumers don't admit to leaving their keys in the car after it is swiped. AAA says the keyless ignitions are also responsible for a growing proportion of the road service calls it handles. 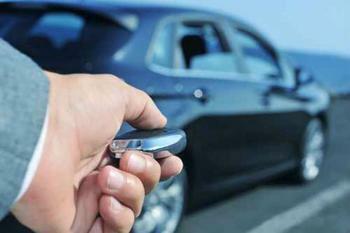 Consumers either lose their fobs or the keyless ignition runs the battery down. “Vehicles today are advanced more than ever, yet are still vulnerable to breakdowns,” said Cliff Ruud, AAA’s managing director of Automotive Solutions, recently. There are plenty of new anti-theft features on cars but, like safety features, they don't do much good unless they're used, the NICB advises. “Anti-theft technology has had a tremendous impact on reducing thefts over the past 25 years, but if you don’t lock it up, it’s not going to help,” said NICB President Joe Wehrle. “Leaving a vehicle unlocked or with the key or FOB inside gives a thief the opportunity to take not only the car, but also any possessions inside. It can also provide access to your personal information if the registration is left in the glove compartment. Wehrle warns that even leaving a car unattended for a minute or two with the engine running or the key fob inside is asking for trouble. Besides stealing your car, crooks can use your registration statement to find out where you live, then burglarize your house or steal your identity. This is even easier if you have your garage door opener prominently displayed on the sun visor. Wehrle advises photographing your registration card with you smartphone so that the card isn't left in the car when you're not there. Whether police officers will accept that as a valid registration is something Wehrle didn't address. Nor did he have any suggestions for where to put the garage door opener if you don't leave it in the car. There are other drawbacks to the fobs as well. It can be fairly simple for crooks to hack their way into some parked cars using the keyless feature. And, since you don't have to physically insert the key to operate the car, it's easy to walk off with the fob in your pocket when you turn the car over to a parking garage attendant or parking valet. This will soon turn your car into an immovable object and you will return to find a very angry valet and possibly a line of disgruntled consumers who have been unable to get their cars out of the garage because yours is blocking the ramp. Some key fobs also have a remote-start feature. This lets you start the car remotely, warming it up on a cold day or -- in desert climates -- giving it a few minutes to cool down before you jump in. Besides inviting theft and wasting gas, this can be an asphyxiation hazard. If your garage is attached to your house, you can asphyxiate yourself and your family by inadvertently starting the car and letting it idle.